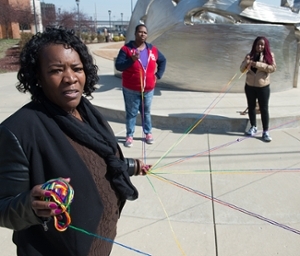 Feelings of rejection and thoughts of hopelessness were on the mind of Angel Dotson the first day she walked into the Connections to Success class, funded by Southern Illinois University Edwardsville East St. Louis Center’s (ESLC) Workforce Development Program. “I had been fired and was extremely depressed. I had low self-esteem and felt crushed, but a Head Start parent educator told me about this program,” said Dotson, whose three-year-old son is in the SIUE Head Start/Early Head Start Program. Dotson is one of six people taking Connection to Success’ second professional development workshop. The three-week course is designed to motivate and help individuals investigate and find training, employment or better employment, and discover and set personal, professional or educational dreams and goals, according to Vera Jones, parent specialist for the ESLC Learning Resource Center and the Preschool for All Program. Connection to Success staffers teaching the classes were: Jenita Hladyshewsky, director of Workforce Innovations, and Precious Smith, Life Transformation coach. 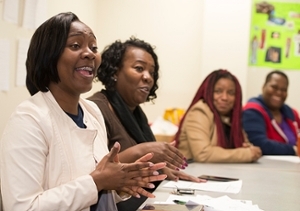 The first Connections to Success workshop began Feb. 13 and concluded with a graduation on March 3. The current class started Feb. 20. Students will graduate at 1 p.m. Friday, March 17 in the SIUE East St. Louis Learning Resource Center on the East St. Louis Higher Education Campus. All six students in the second class are registered to enter the Lume Institute’s Child Development Associate program. The five-week course prepares participants to obtain their Child Development Associate (CDA) credential and offers a paid two-year apprenticeship after they complete course work, complete their professional portfolio and sit for the CDA examination. Successful participants can be employed as a teacher’s assistant apprentice within four to five months of entering the program. “The SIUE East St. Louis Center is partnering with the best in class training providers, such as Connections to Success and the Lume Institute,” said Johanna Wharton, director of ESLC’s Workforce Development and Strategic Partnerships. “The goal is to meet the needs of parents of the youth that we serve in programs offered by the SIUE ESLC and adults being served by partner organizations. Since parents are the key to success in the homes, it is important to motivate them to be their best, said Smith. “My husband (Darius) and I started a commercial cleaning and car detailing business in 2016,” said Ashley Mackin, of East St. Louis, who was in the first class. “This course helped us put paperwork to our business.” Darius Mackin also graduated from Connection to Success’s first professional development class. Mackin enjoyed the course so much that she told her mother-in-law, Lisa Joe, and her sister-in-law, Rachel Gibbs. “This class was my first step in enhancing my career,” said Joe, of Cahokia, who was injured on her job after working 14 years as a psychiatric technician at St. Louis University Hospital. Extoling the virtues of Connections to Success’s professional development course are from left to right: Tierra Gibbs and Lisa Joe (both graduates of the course) and Gloria Hicks and Cheryl Washington. Lisa Joe, holding ball of yarn, leads the exercise that identifies the nine life inventory subjects and discusses her plans for each category. In the background are Cheryl Washington (left) and Gloria Hicks (right). Students of the second Connections to Success second class are shown with a few graduates of the class: L-R: Rachelle Gibbs, Angel Dotson, Jane Brown, Lisa Joe (graduate), Gloria Hicks, Cheryl Washington, Tierra Gibbs (graduate) and Ashley Mackin.